Facing multiple opponents is the worst possible situation to find yourself in, and you should avoid it if possible. If you pay close attention to your surroundings, rather than tuning out to listen to music or retreat into your thoughts, you should be able to spot a multiple ­assault before it happens. 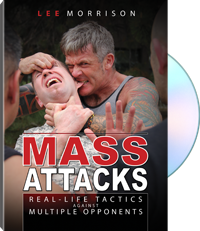 Situational awareness and avoidance is the premise on which Lee Morrison, an active combatives instructor and the author of Paladin's best-selling Urban Combatives V1 and Urban Combatives V2, has built his system for defending against multiple opponents. For Mass Attacks, Morrison draws from his vast experience with multiple threats to teach potential victims how to avoid, de-escalate, or fight against multiple assailants. Make sure that you are mentally prepared for a fight with multiple attackers. Know that just as they can knock you out, you can also knock them out. They may outnumber you, but they are not invincible. Show that you are a bigger predator than they are. Hit first, hit hard, and place clinical shots to clinical targets. Eliminate your opponents one by one, using each as a shield between you and the rest. The exception to the above advice is when you are a victim of a mass attack – when you face four or more opponents. In this case, it's all about limiting damage to yourself. Don't let your ego talk you into a suicidal fight. Protect yourself, especially the head and spine, and get away as quickly as you can. That way, you live to fight another day.